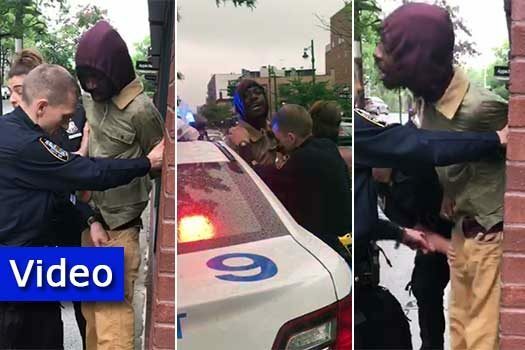 A man was arrested after going on an anti-Semitic tirade, threatening to “kill all the Jews”, spitting and throwing rocks at Jewish women and children on Carroll Street in Crown Heights. 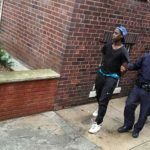 Police have arrested a man who went on an anti-Semitic tirade and threatened to “kill all the [expletive] Jews” while spitting on and throwing rocks at Jewish people walking on Carroll Street in Crown Heights. The incidents occurred at around 7:00pm in the vicinity of Carroll Street and Albany Avenue where the suspect, a Black man in his 20’s, was observed walking and yelling at every Jewish person he passed. His erratic behavior began escalating when he began spitting at passersby and even throwing rocks – one of which struck a young Jewish girl. Police officers confronted the man outside Apple Bank on Albany Avenue. 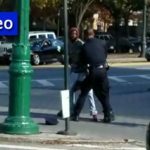 As officers attempted to take the man into custody he began resisting while shouting more expletives at the cops and at Jews that were standing nearby. As officers struggled to put the man into their car, dozens of additional officers responded and helped get him under control. Crown Heights Shomrim assisted the police department by locating some of the victims and bringing them over to the precinct in order to file a report. he was realest from jail 2 days ago. Thank you NYPD for arresting this ill individual. I was there walking right there at tonigjt . He threw 2 rocks and missed My one month old son’s stroller by a few inches . If they need anymore witnesses… He threw 2 rocks in my direction, narrowly missing my newborn baby in his stroller. . I obviously ran away to protect my child , but if they need my testimony I’d be glad to come forward . Get this guy off the streets!! Or 71 precinct at 718-735-0511. I am the mother of the girl hit and have been in touch with the DA. They saw your comment and would like to be in touch with you. Please call me at 347-850-2358. We are meeting with them Friday morning so we need the information ASAP. They want to make sure he does not make bail. The more evidence they have against him will help ensure that. Before you start complaining about the situation and the lack of safety keep in mind that if everyone in C.H. voted the politicians wouldn’t want to lose our vote and would make sure the police keep us safe and the District Attorney doesn’t let these animals back on the street when they’re caught. If we all voted our elected officials would see to it that the District Attorney does his job and locks these dangerous criminals up. Right now he cares more about them than us and lets them free so they could do more of the same, and the politicians couldn’t care less. The answer is the DA lets them out. What are we going to do about it?? Nothing!! We’re too lazy to go and vote him out. We just like to whine and do nothing. The District Attorneys don’t like us very much so they treat these people very nicely. If we all voted maybe things would be different. this pathetic disturbed hateful person kept spitting at the cops. In the old days they could whack him once or twice to get him to stop but this is just another example of how upside down the world is. So you’re for the police breaking the law and becoming criminals themselves, but you are confident that if they do so they will only commit their crimes against other people, not against yourself? Protect yourselves. Use common sense. DO NOT walk alone at night & quite honestly, try to avoid quieter cross streets alone during the day. Take those earbuds OUT! Be aware, be vigilant! Put your phone away, you can wait 5 minutes till you get to your destination before you start texting & speaking. CH residents need to do their bit as well. So much mental illness out there. PLEASE EVERYONE as soon as you see someone behaving strangely just call Shomrim & NYPD. As you can see from the previous comments many people saw this guy acting strangely even before he started throwing rocks. If you call immediately you may save a life!! There’s a nice currently erupting volcano in Hawaii where this creep should be thrown into. This is the same guy arrested on 11/09/17 and released the next day for exactly the same crime. He is even wearing the same hoodie. See CH Info of those days for the video. Milhouse,could not be impersonated by a human. The police deserve the right to protect themselves. Even if some people life out. They are busy taking care of our Safety they should have the option of self defense. Some people are born with a mental health issue. Other times, you can fry your brain on drugs, LSD, crack, and you can have no restraint and experience delusions. I hope the Jewish community sees that the mentally ill become exponentially more dangerous when they are mentally ill racists. No money for affordable housing yids, but money for the mishuganas.